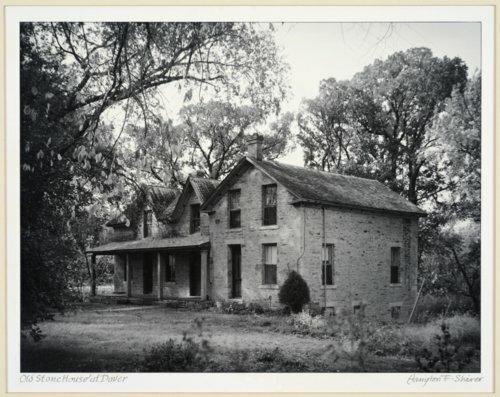 This is a photograph of the Sage Inn in Dover, Kansas. It was possibly built by Alfred Sage or his brother Mark. The Sage brothers were masons for the original Kansas Capitol (east wing) in Topeka from 1866-1869. They also built the Crane farm which is the administration building for the Topeka Cemetery. The stone building known as Sage Inn was originally built as a residence in 1878 at a cost of $1,300. According to some accounts, the south wing was added to the building around 1882. Alfred Sage who owned the building was a successful farmer, businessman, and public figure as well as a pioneer. Sage Inn is on the National Register of Historic Places.